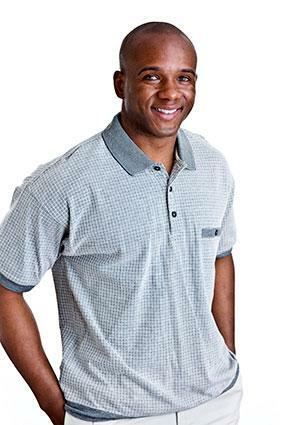 The polo shirt is a short-sleeved, open-necked white wool jersey pullover with turned-down collar, first worn by polo players from the United States and England. It is one of the first pieces of men's bona fide sports apparel to filter into mainstream fashion at all levels of the market. Like most sportswear, the polo shirt was functional in origin, designed to allow players greater freedom of movement on the polo pitch. Originally (that is, around 1900), the polo shirt was usually made from cashmere or, sometimes, from a mix of silk and wool; the cloth was designed to be close knit and absorbent. Although it was designed specifically for the rigors of polo, during the late 1920s the polo shirt was given a stamp of approval by the fashionable. It could be seen on the French Riviera as well as on the influential Palm Beach set, many of whom were wearing them on the tennis courts. By the 1930s the all-white polo shirt had become a classic, and brightly colored polo shirts had become very popular as golf wear. It was not until 1933, however, that tennis star Rene Lacoste adapted and redesigned the classic polo shirt specially to be worn for playing golf and tennis. He is understood to have said at the time: "Pour moi, pour jouer au tennis comme au golf, j'eus un jour l'idee de creer une chemise." (For myself, I had an idea one day to create a shirt for playing tennis as well as golf.) (Keers, p. 316). Lacoste's white cotton pique shirt featured a green crocodile logo, both on account of his nickname, "Le Crocodile," on the tennis court, and also as a trademark to help prevent imitations. By 1935 the polo shirt was as popular off the sports fields as it was on them. A journalist sent to the Riviera pointed out: "Polo shirts have resulted in the oneness of the sexes and the equality of classes. Ties are gone. Personal touches, out. Individualism, abolished. Personality, extinct. The Riviera has produced a communism that would be the envy of the U.S.S.R." (Schoeffler, p. 578). This popularity endured, and the polo shirt became a cult shirt later taken on as a style essential by label-conscious football terrace casuals and customized by B-boys and Fly-girls during the late 1970s and 1980s, and often worn with Lyle and Scott or Pringle Knits. Meanwhile a version by Fred Perry was the polo shirt of choice by skinheads in the 1970s, the gay crowd during the 1980s, and more recently certain exponents of Britpop and skate (as freedom of movement is still key). Although Lacoste was there first, Ralph Lauren has built an empire in part on his version of the polo shirt. The pique shirt with the iconic polo player logo was the shirt for the status-conscious consumer to own during the 1980s. Aimed at a more exclusive segment of the market, the Polo, was cut longer and narrower than the French version and continued as a cult classic among the more affluent, the label-conscious, and vintage experts alike. See also Jersey; Sport Shirt; Sportswear; T-Shirt. Hardy Amies. A, B, C of Men's Fashion. London: Cahill and Company, Ltd., 1964. Byrde, Penelope. The Male Image: Men's Fashion in England 1300-1970. London: B.T. Batsford, Ltd., 1979.